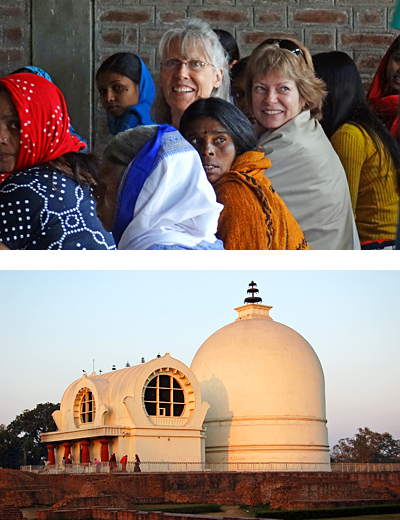 You are invited to participate in one of DharmaJiva’s study and pilgrimage tours to India. These tours are oriented towards Buddhists from the West who want to learn first-hand about the modern Buddhist Revival and visit the historical sites where Shakyamuni Buddha lived and practiced. The tours include visits to centers of the new Buddhist movement, including temples, meditation centers, schools, hostels and clinics. There are opportunities to attend seminars on the Indian social situation and the reform efforts of different Buddhist groups. Since India is the birthplace of Buddhism, the tours also include visits to important Buddhist sites including Bodhgaya (where the Buddha was Enlightened), Sarnath-Varanasi (site of the Buddha’s first teaching and a famous holy place on the River Ganges), Shravasti (site of the Jeta Grove where the Buddha spent many rainy seasons), Kusinara (where the Buddha died), Nalanda (site of an ancient Buddhist university), and Rajgir (where the Buddha gave many important teachings). Tours are led by experienced Indian Buddhist guides, and transportation is provided in air-conditioned vans and trains.